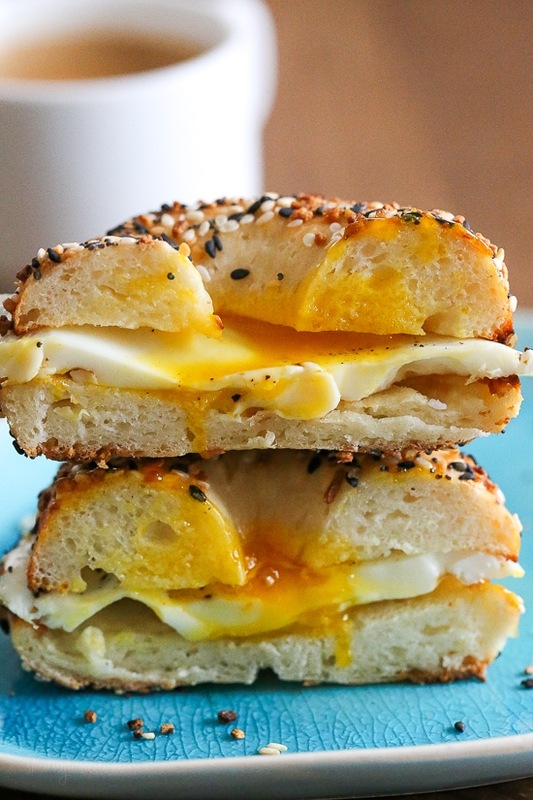 I’m totally obsessed with these bagels!! 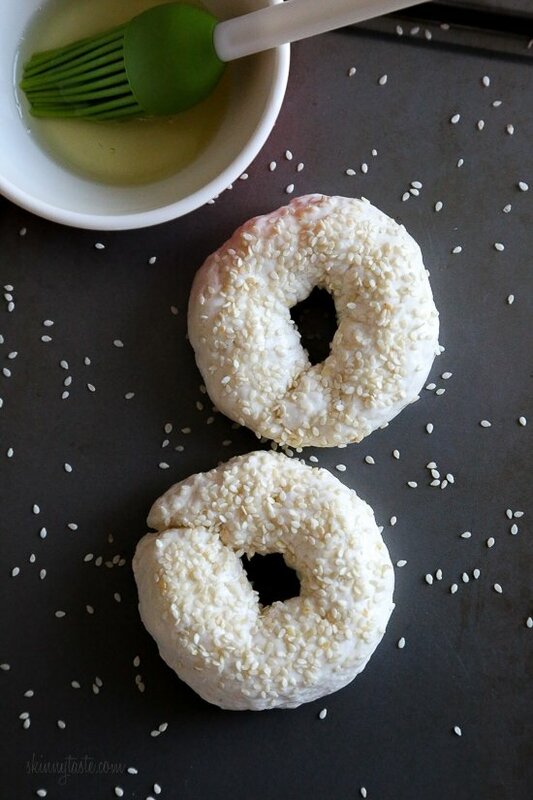 I’ve been busy testing them out all weekend in my oven and air fryer, with different types of flours after finding out about these Greek yogurt bagels which are all the rave in the Weight Watcher community (Only 3 Smart Points!). They are high in protein thanks to the yogurt, and taste so good, warm right out of the oven. We had it with a little butter but cream cheese would be great too! The original recipe uses self rising flour, but I prefer to make my own since I never have it on hand (it’s easy, just add salt and baking powder!). I also skipped boiling them and they were still great and expanded quite a bit. My husband Tommy considers himself a bagel connoisseur, he’s the pickiest bagel person I know and travels to every bagel shop around NYC just to find the perfect bagel, so I wasn’t sure if he would love them, but he LOVED them and was happy to help me test them out. They are a tad soft in the center, but we both agreed we liked them like that. If you don’t leave them in the oven longer. I tested them out with wheat and gluten-free flour, and they both worked although the gluten-free version took longer to bake and didn’t rise as much as the wheat version. I tested this both in my oven and Skinnytaste Vremi Air Fryer that you can pre-order now, it comes out early May! The results came out great in both, but the gluten-free version was best in the air fryer, they were browned and took half the time. 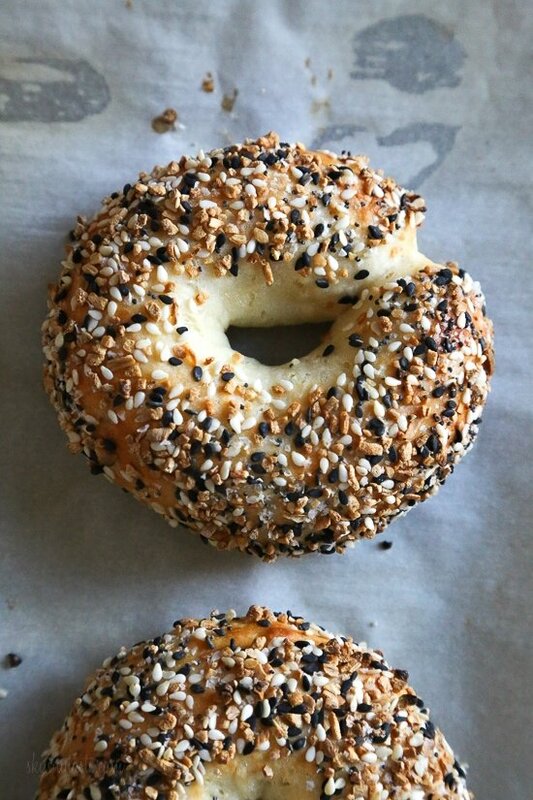 These bagels are perfect to whip up for breakfast, you can make the dough ahead and refrigerate, then roll them up and pop them in the oven while you get ready for your day! The dough should be at room temp before baking, so if you plan to do this, give it an hour to rest before baking. Use a silpat or parchment paper sprayed with oil to prevent them from sticking to the baking sheet. To hold the parchment to the baking sheet, spray a little oil on the corners. 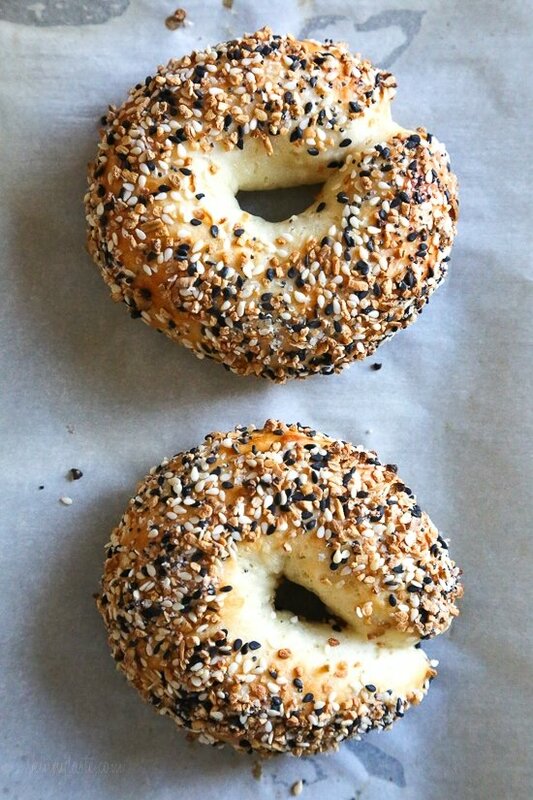 The bagels expand when they bake so you’ll want to make sure they have plenty of room so they don’t stick together. Greek yogurt instead of plain is a must, if there’s any liquid in the yogurt be sure to drain it. I tested with Fage and Stonyfield Greek, both worked great. I increased the oven to 400F and let them bake 20 minutes, then I let them cool before cutting open. In the air fryer I baked 325F 12 min turning halfway. Let cool before cutting. I swapped the yogurt for equal parts silken tofu and also had great success. This is a good 0 point alternative. I was able to make them dairy-free, gluten free using both methods and Bobs Red Mill 1 to 1 GF flour, increasing the bake time for GF 10 minutes. 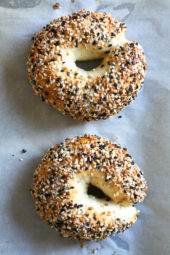 You can wrap leftover bagels in plastic and reheat the next day without refrigerating, or refrigerate for up to 3 days. To freeze, slice open and wrap individually with foil or plastic wrap. To reheat pop them back into the oven, toaster or air fryer until warm. You can make the dough ahead and keep it wrapped tight with plastic for up to 3 days refrigerated. 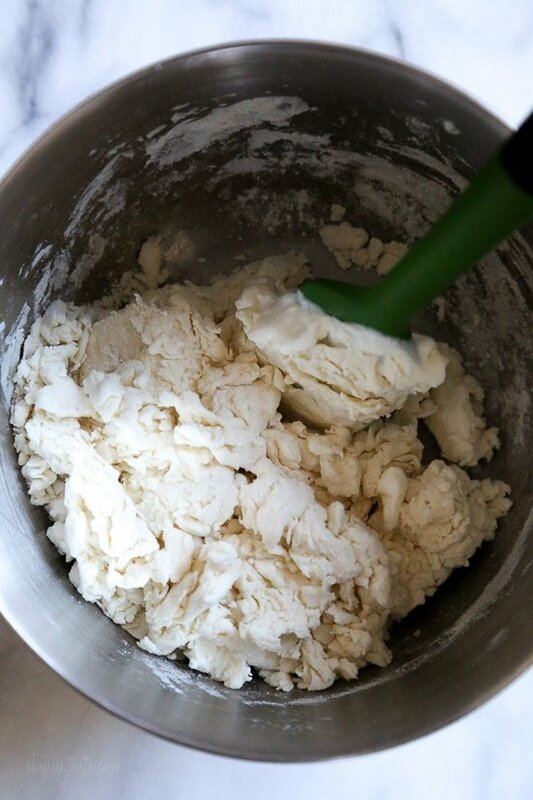 If you’re cooking for 1, simply take 1/4 of the dough out an hour ahead and bake it in the morning. The dough should be room temperature before baking. 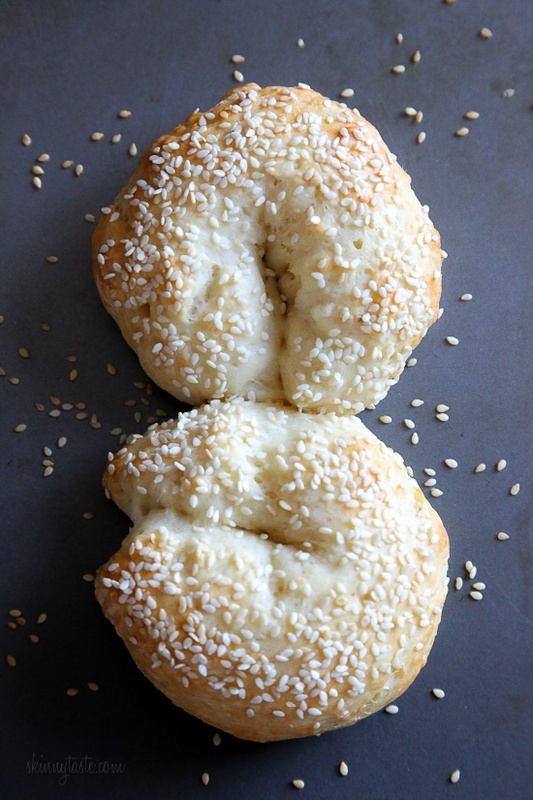 This easy homemade bagel recipe is made from scratch with just four (5) ingredients – flour, Greek yogurt, egg white, baking powder and salt! No yeast, no boiling, no fancy mixer. Bake them in the oven or in the air-fryer! Top with egg wash and sprinkle both sides with seasoning of your choice. Bake on the top rack of the oven for 25 minutes. Let cool at least 15 minutes before cutting. Preheat the air fryer 280F degrees. Transfer in batches without overcrowding and bake 15 to 16 minutes, or until golden. No need to turn. Let cool at least 15 minutes before cutting. What kind of seasoning did you use in the video? Going to give them a try tonight! Does wheat flour not rise as well? These are awesome . My son’s thought so also. They are picky about their bagels. Thanks for all e great recipes. Can’t wait to have my grandson try them. Question, is it one single serving cup of greek yogurt (the 5.3 oz cup in the store) or an 8 oz cup? Thanks! I just made those with spelt flour, it was a little sticky with the recommended one cup so I added some regular flour until a dough formed. They turned out great. 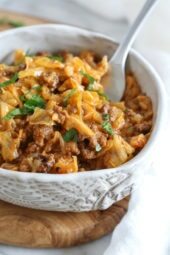 I can’t thank you enough for this recipe, and all your tips. I’ll be passing the link along to my gluten – intolerant daughter, so she can give them a try. I came to your recipe via another site that had “tweaked” your recipe, but not for the better, I’m afraid. I made those bagels last night, using White Lily self-rising flour, and baking for 20 minutes at 350°, then for 3 more minutes at 500° to brown them, all on the center rack. Not even close to the way your recipe turned out this morning, using regular (King Arthur) flour, plus baking powder & salt, and the egg wash, baked on the top rack at 375° for exactly 25 minutes… Perfect! My husband has eaten 2 already, and asked if I need anything from the store to make more. (He barely choked down one of the others last night, and didn’t say much. )I served them with Cinnamon-Raisin Schmear, from Real Simple’s website, using fat-free cream cheese, and no nuts. (1 WW SP per tablespoon.) Very scrummy! Can you use Einkorn flour instead of All – Purpose flour? Officially obsessed! Getting as much liquid out of the yogurt is definitely key. Chobani was way too runny so I tried Fage with better results. Can’t wait to experiment with flavors and meal prep some breakfast sandwiches. The Easy Garlic Knots are beast too. 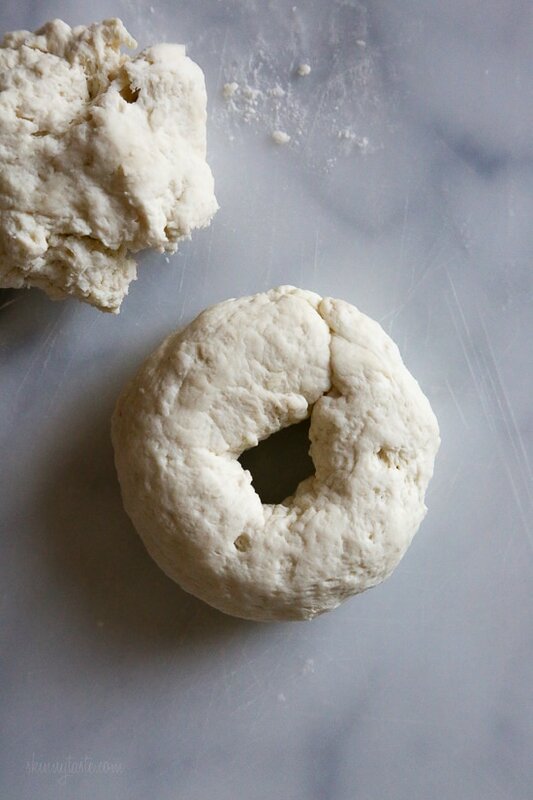 Would love to hear more about what others have tried with this dough recipe, such as naan. Have you tried adding fruit to the dough? Like thawed and drained frozen fruit? I’m wondering if it would work or if it would be too runny? I tried the oven and air fryer. Finally, made them in a doughnut pan. It made nice thick bagels and they were easier to slice without the bagels breaking. For anyone who doesn’t like the sourdough flavor or needs it to be dairy free, I’ve been straining regular almond milk yogurt to make it ‘greek’ bc I cant find Greek almond milk yogurt here. My kids much prefer the flavor of these bc they don’t have the lingering sour flavor from the regular Greek yogurt. And I’ve been making 8 mini bagels instead of 4 full sized ones. I love these. I tried them baked and in the air fryer. I find that I much prefer baked. People love their air fryers and I haven’t found that love yet, now my IP yes, love, air fryer, not so much. I found the baked version more bagel like. 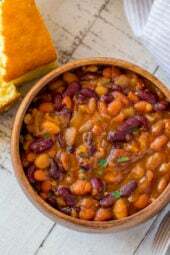 Have you tried this with Einkorn flour? I have been making these weekly for almost a year and my son eats them everyday for breakfast. 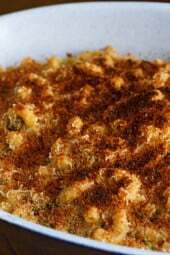 I have read a lot of good things about Einkorn and wondering if it would work in this recipe. Thanks!! I suggest foming each portion of dough into a ball then poking your thumb through the middle and stretching the bagel slightly to get a continuous unbroken bagel. I’ve been doing WW for a couple months and have seen these bagels EVERYWHERE, so I’ve been eager to give them a try. This recipe is actually what led to us getting an air fryer, which I’m not obsessed with, which worked out well, too. I like almost everything about this recipe except for the raw flour taste I get, in the end product. You mentioned that you don’t boil these, like a regular bagel, but I noticed that none of the other recipes call for boiling… were you just reiterating that they are boil-free? Or were you looking at a recipe that does ask for boiling. Could that be why I’m getting such a raw flour taste? 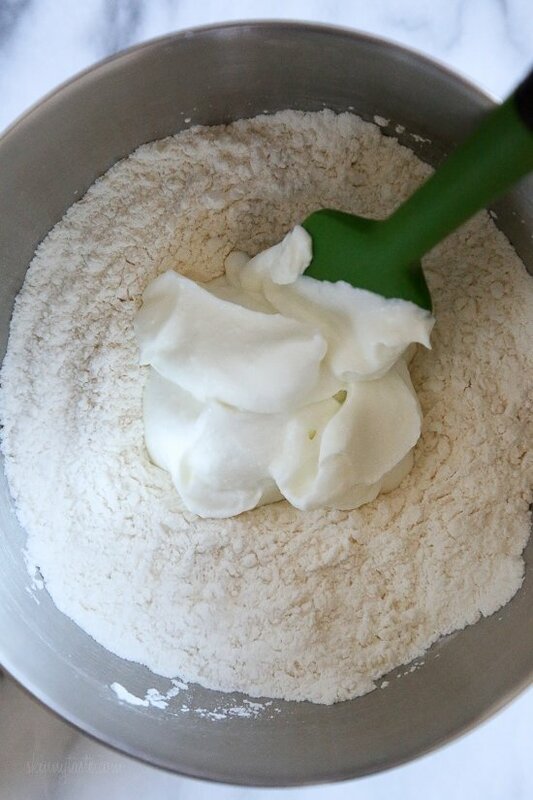 I also read through a bunch of comments and no one is mentioning the raw flour… is it just me? What am I doing wrong? Not sure, what brand and type of flour are you using? 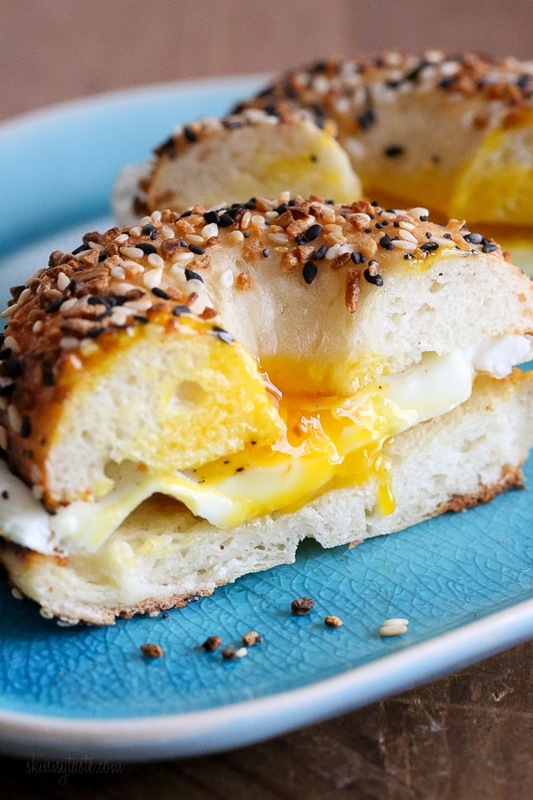 Traditional bagels with yeast are boiled, but that shouldn’t change the taste. I have made these several times. Today I ran out of all purpose flour so could only make one batch with that type of flour. I made the second batch with bread flour and those baked on the same baking sheet were easily at least 1/2″ taller when finished baking. I will be using bread flour for this going forward. I slice them when cooled and slip a small piece of wax paper between top and bottom. When I am ready to toast them from the freezer they are easy to separate for the toaster. Do you think using almond flour would work?! Maybe just use a little more yogurt? I tried it with almond flour and it was so sticky, i ended throwing away the whole batch.. maybe an almond flour blend would work? I just used it with almond flour and it required more than a cup but man did it hit the spot with a healthy carb option! did you add more than a cup of almond flour or more than a cup of greek yogurt? Is it 5 oz flour or 1 cup (8oz). ? My dough was too sticky, kept adding flour, did not work so did not bake. Help! Are they supposed to be small and hard? I baked mine in the air fryer. You could probably lay a piece of foil over them for the first half of baking. I have done that a lot with baked goods when my oven wouldn’t cooperate. I followed the directions precisely and baked in my oven. The bagels are very dark and taste like a soft pretzel- they have the pretzel colorntoo.